Have you ever seen a skilled Tetris player performing and thought to yourself, "He must be great at packing a moving truck?" We put that notion to the test, assembling several handy moving tips from a Tetris pro. 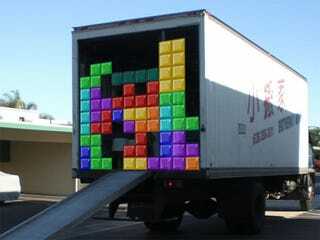 Tetris masters aren't that easy to find. There are no large, organized tournaments for the game and its countless variants, so we reached out to The Tetris Company, which put us in touch with John Tran, a 25-year-old Tetris master from Menifee, California. Tran mainly practices his skills on the online Tetris website Tetris Friends, where he regularly scores high in the leaderboards. When he isn't playing, he hangs around his Tetris community site, Harddrop.com. Why do people consider him a Tetris pro? "I think the main reason why people consider me a pro is for my multiplayer skills. I try to combine high speed play with efficient down-stacking and improvised T-spins to put heavy pressure on my opponents," Tran explains, using language that only a true Tetris aficionado would understand. "When I first started playing I kept having Tetris dreams," says Tran, explaining an experience shared by many other Tetris players over the years. But where many stop at the dreams, John has carried his expertise into real life. "I started noticing how shapes fit together such as boxes, books, or whatever else was in my room. It comes in handy when you're organizing or cleaning up." • "Take a glimpse at your next pieces (moving boxes in this case) to determine the best placement positions." Think ahead. Putting a box in a spot that fits nicely might seem like a fine accomplishment, but when it makes it difficult to place subsequent boxes it does more harm than good. • "If you have a box that doesn't fit neatly, hold onto it and un-hold it when it won't mess everything up." The urge to simply cram everything into the back of the truck as quickly as possible is strong. Don't force it. If a container doesn't fit, simply set it aside until it does. • "Stack as flat as possible. The even field will save you reaction time and give you more stacking options." Not only will stacking flat allow for more stacking options, it'll also increase stability, reducing shifting while you make your move. • "Avoid creating unnecessary gaps to maximize space usage." This tip goes along with saving pieces until there is a good spot for them. Don't leave gaps. If you need to, dig through what you're packing to find something that will fit the space. A tight pack is a stable pack. • "Leave an empty column open for your long boxes, and if you don't have any long boxes buy some." Long boxes aren't just for comic books anymore. The long, slender containers are perfect for filling gaps where wide boxes won't fit, adding precious stability to your stack while maximizing space usage. • "Don't waste your long boxes!" That having been said, don't simply toss the long boxes in where they aren't needed. Save them for when you need to make a packing Tetris. A nice long box can stabilize several rows of boxes all at once. • "Multiplayer will help you reach a faster time, so have some friends and family help you out." Extra hands are always helpful when packing, but make sure you and your friends and family are on the same wavelength. Without coordinated strategy, even the strongest stack can topple. Before we say goodbye to John Tran, the Tetris Master gives us one more tip on getting the most out of the popular puzzle game. "I think Tetris teaches you patience and how to plan ahead in real life just like you do in the game." I think he's proven his point.